Talk about location! The superbly comfortable Snake River Lodge & Spa is your gateway to unexcelled, four-season scenery and adventure in the Grand Tetons. Back in the early 1800s, intrepid beaver trappers would return east from their treks through Wyoming with tall tales of thermal pools, rushing rivers, shimmering forests, and rugged mountains. Thankfully, you can still experience this untamed wilderness and beauty from Snake River Lodge & Spa. And your adventures—albeit of a much softer kind, such as skiing over 2,500 acres of groomed terrain—will be cushioned by a steaming, cave-enclosed hot tub and an expert rub-down at the end of the day. 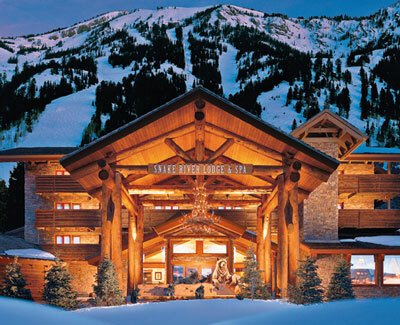 For unexcelled outdoor activities, this comfortable and classy adventure resort is situated slope side at Jackson Hole Mountain Resort, and a mere mile from the southern entrance of Grand Teton National Park, with its snow-peaked mountains, pristine lakes, and extraordinary wildlife. Schuss to the ski valet's door, then head for the fire pit by the resort's dramatic indoor-outdoor pool, with boulder-strewn, cascading waterfalls and stunning mountain views. The cozy main lobby features stylishly rustic furnishings, stuffed-and-mounted bison and cougar, leather and animal-hide upholstery, and a huge stone fireplace with a massive rough-hewn log mantel. The Gamefish Restaurant also plays to the region's strengths, with its impressive selection of Wyoming Angus steaks, native fish, and grilled and smoked game. A restful stay is ensured when you choose from among guest rooms with balconies to three-bedroom suites with top-of-the-line kitchens, sound systems, and Jacuzzi® tubs. Bedrooms have such fashionable touches as ironwork wall sconces, plush fabrics, and heated bathroom tile floors. Jackson Hole is nature's playground at its finest, but if its natural luxuries still haven't satiated you, simply avail yourself of the Lodge's private, in-room dining, valet parking, 24-hour guest service, and pampering treatments at the spa.